You may 'click' on the above thumb-nail image up to 2 times to fully expand and see the full 52 tab set. 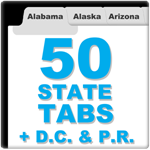 - All 50 States Tabs! Now with District of Columbia and Puerto Rico as per your request!. 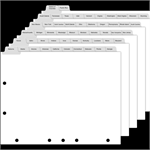 Let our State Tab Dividers help organize your project. Our 52 State Tabs are packaged in a 2 Set Pack. Beginning with Alabama, ending with Wyoming, plus two additional tabs for District of Columbia and Puerto Rico, you'll have all 52 States collated into a convenient 2 Set Pack. Do you need Custom Index Tab Dividers? We make Custom Printed Index Tab Dividers to your exact specifications. Custom Index Tab Dividers are available in a variety of materials and colors. This product is well made and ships quickly. We buy these here all the time. No one else has anything remotely similar! Use this product in my business. The others out there do not include DC.